After a long day spent fishing for all manner of sea creatures, you won’t leave our Key West fishing boats feeling disappointed. You certainly won’t be leaving our charter empty handed either. Our experienced crew members have a knack for helping even the most inexperienced of fishermen bag a big catch. People on our boats tend to reel in tarpon, shark, sailfish, marlin, snapper, grouper, kingfish, and even mahi-mahi. Whether you’re interested in light tackle fishing, backcountry fishing, or deep-sea fishing, our boats can handle the task! No fleet would be complete without the individual manning the decks. Captain Moe personally handpicks each and every candidate, trains, and works with each captain to maintain the highest level of professionalism possible. Each charter returns with satisfied fishermen who were out for the fishing trip of their lives! The Lucky Charm – A 42-ft custom Stapleton Sportfish skippered by Captain Moe himself. 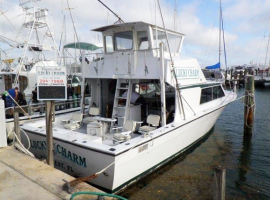 This locally-built boat was made for day charter fishing right here in Key West. Amenities include the latest reels and rods, custom-built fishing chairs, and modern plumbing. Reel Lucky – The Reel Lucky is a 30-ft custom Proguide Dorado – the jewel of our current fleet. Equipped with an inboard diesel engine and plenty of space for fighting fish, The Reel Lucky seats six! Reel Lucky Too – Our 26-ft Panga is the newest boat in the fleet. If you’ve ever traveled through the Caribbean, you will recognize this particular boat. She’s a stable, comfortable ride that is perfect for catching tarpon or hunting sharks around the Gulf. Contact Us About Our Key West Fishing Boats! To book one of our comfortable, efficient Key West fishing boats, contact Captain Moe’s Lucky Fleet by calling 305-304-8065. For your day trip, our crew will help you settle into the perfect boat. In fact, whatever you’re trying to catch, we’ll help you along!